A fellow photographer friend of mine sparked this post by telling me earlier this week that he'd decided to go a different direction with his headshot work and use speedlites instead of studio strobes. I didn't agree but kept my mouth shut about it. One key reason that I kept my mouth shut is that I know this photographer often does his homework on things like this and makes the decision that he feels is best for him. However, he texted me last night that he thinks he's going with the studio strobe option instead for headshots. After this post, maybe you can decide which option is best for you based on the types of shoots you do most often. Quick Note: You can go with less expensive lighting options than the two above, but the concept of this post still applies. Also, this post is not about the features of each of the lights above. It's more about using a studio strobe or a speedlite or both. I personally own both of the lights pictured at the top of this post and they are both wonderful lights. However, they serve different purposes and one can be more useful than the other for various shooting needs. Four Quick Advantages Of Studio Strobes: More Output Power, Modeling Light (may or may not be helpful), Faster Recycling Time and Wall Plug (which can still easily be powered outside with a vagabond mini for $239). When I shoot on the go events, it's a NO-BRAINER that the Canon 600 EX-RT is the way to go. It's portable and with a good battery pack will get me through an 8 hour event. The Einstein could come in handy for stage shots if the client permitted popping in the corner of the room, but most clients don't want that and the pop noise of an Einstein is one of my least favorite things about it. It's 100% true that speedlites can be used for headshots and other portrait work. However, speedlites do not have the lighting power or recycling time of an Eintstein or other studio strobe plus the speedlite runs off batteries and a studio strobe outlet plug in power. Oh, you are thinking ...battery pack for the speedlites. Well, you still cannot beat plug in power. But you are thinking outside. Well, you can pick up a vagabond mini for $239 from Paul C. Buff and you are covered on the go. I own two of them. It's not uncommon for me to be hired by a company to shoot on location and have 15 to 20 or even 50+ different individuals and to shoot numerous shots of each one. I just cannot put my business on the line with speedlites in that situation. I had a shoot this past Monday that lasted nearly 8 hours and included background headshots, outdoor headshots, conference room shots, meeting room shots and general office shots of people at their desk. Not only did I need the plug in power of a studio strobe, but I also needed the power output of a studio strobe. I would not have done the shoot with speedlites unless I absolutely had no other option. Even then, I think renting studio strobes would have been better than relying on speedlites. For a smaller photoshoot on a background, around the office, around the house or even outside, a speedlite could be the perfect fit for portability when the 2 to 5 second recycling time (pending battery pack or not) doesn't matter as much. For me personally, I had still rather use a studio strobe in most cases, but that's just me. It doesn't make it right or wrong either way because sometimes it just comes down to personal preference. There are a lot of photographers that do amazing things with speedlites. I can hold my own with them but prefer studio strobes for certain types of shooting. I photographed a group of 233 people about 17 rows deep this past summer. Although it was outside on large steps, I needed the FULL 640WS of TWO Einsteins to get me to f/22 and fill in the light. Can you imagine how many speedlites that would have taken? A lot! So there are times that a speedlite will not work and studio strobes are a must. Speedlites and studio strobes each serve a purpose and there are times when one is more practical than the other. The easy answer is that if you can afford both ... have both. If you have to choose one or the other, it's likely best to have speedlites (pending what most of your work is) and rent studio strobes when you need them. However, there are so many low cost options for both speedlites and studio strobes that it's not impossible to have both. For instance, it's rare that you would need more than 300WS for most portrait work. You can get the Alien Bee B800 for $279.95 which gets you two for just over the price of one Einstein. 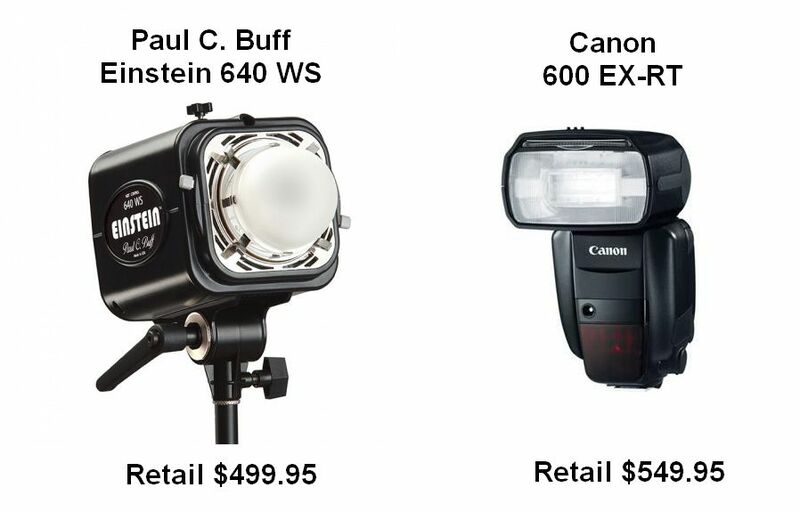 You can get a manual off brand speedlite for under $100 or a TTL speedlite similar to the Canon 600 EX-RT for about $150-$200 less by going with Metz or Phottix.